Breathable and Comfortable: Mesh palm design keep your hands always dry and cool with proper airflow, No more odor. Pre-curved anatomic hand design allow for proper fist closure & maintaining focus while training. The shock dissipating gel infused foam provide more support and more to protect your hands while Boxing, Kickboxing, Muay Thai, MMA and Sparring Training. Premium PU leather construction and impact foam makes these boxing gloves more durable, and easy to clean and maintain. Secure Velcro Closure System to Increase Stability:A secure velcro wrist closure helps avoid unnecessary sprains and injuries, make easily to put on and take off. 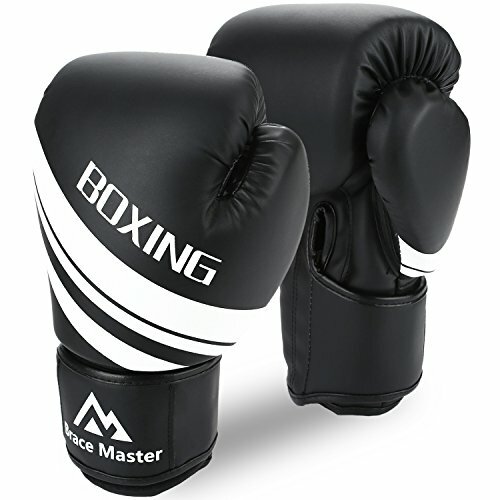 Brace Master is a company to support the products about MMA, Boxing and Fitness Sports, the enterprise start in 2015, an avid boxing fans, who is not satisfied with the protective gear about MMA, and found this company to dedicated to providiing premium product to the customers. After more than 3 years of development, Our products involved all field about MMA, Boxing and Fitness. Also we have gain a lot of fans. 2018, we do hope to support more better products to our loyal customers. ·Breathable and Comfortable: Mesh palm design keep your hands always dry and cool with proper airflow, No more odor. ·Pre-curved anatomic hand design allow for proper fist closure & maintaining focus while training. ·the shock dissipating gel infused foam provide more support and more to protect your hands while Boxing, Kickboxing, Muay Thai, MMA and Sparring Training. ·Secure Velcro Closure System to Increase Stability:A secure velcro wrist closure helps avoid unnecessary sprains and injuries, make easily to put on and take off. ·Premium PU leather construction and impact foam makes these boxing gloves more durable, and easy to clean and maintain. 16 oz gloves: Person over 180lbs. Click the ADD TO CART button above and start training with Brace Master.